The yester year (1988) Sunday Observer Outstation Schoolboy Cricketer Sanath Jayasuriya who hails from St. Servatius’ College, Matara, will bid adieu to rigours of International Cricket with just 2 days away from celebrating his 42nd birthday while in action in England. 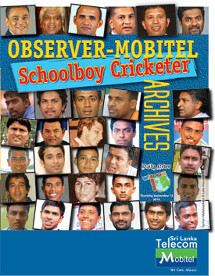 OBSERVER - MOBITEL: The encouragement given by the parents and the school was the key to success of the Observer-Mobitel Most Popular Outstation Schoolboy Cricketer of the Year 2011 Keshan Gamage. Last year’s Observer-Mobitel Schoolboy Cricketer of the Year and former Royal captain Bhanuka Rajapaksa once again lived out to expectations by making a marathon knock of 149 runs for Sri Lanka Under-19 in the first youth Test against the touring England Under-19 team now in progress at Galle International Stadium. Sri Lanka’s first-ever schools cricket awards ceremony which has been recognising young talent for over three decades is on once again. The 33rd Observer-Mobitel Schoolboy Cricketer of the Year contest will be launched once again with the dawn of the New Year.